Last Sunday, after the Steelers squeaked by Miami on questionable and confusing calls & explanations, we made our way into the kitchen and opened a bottle of Frog's Leap Sauvignon Blanc. Check out the cork: Ribbit! As we sipped our wine, we started chopping vegetables (onions, celery, carrots), cubing chicken, and gathering ingredients to make Creamy Chicken & Rice Casserole with Peas, Carrots, and Cheddar, another recipe from the Cover & Bake cookbook. This recipe takes a bit of time -- probably about 1.5 hours total from start to finish. 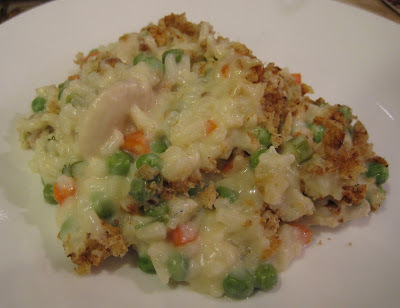 But it makes a deliciously creamy casserole, if a bit rich. 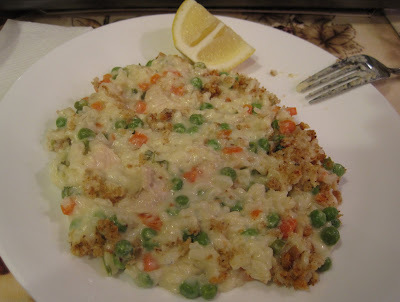 The Cook's Illustrated folks again succeeded in making a comforting, tasty, moist, non pasty dish. The recipe says to sprinkle parsley on top of the casserole and serve with lemon wedges, but we added the parsley to the dish prior to baking. I scooped out some casserole and plopped it on my plate: Then I remembered to squeeze a bit of lemon on top, so I took a another photo, with the lemon wedge perched on the side of the plate: I really enjoyed this casserole. It was sort of like a risotto, loaded with lots of goodies. I would definitely make this again. SP has a slightly different opinion. He likes it. It's very tasty. He would make it again. But, as a Type 1 diabetic, he thinks it's not a great dish for him. SP was diagnosed when he was 3 years old. He has lived for many years managing this disease. He is perfectly capable of monitoring his blood sugar level and taking insulin or eating something when his glucose monitor beeps. He does not need me to fuss over him or to try to change his diet or tell him how to eat. In fact, I should be taking lessons from him on how to eat healthier. Since I trust him, I don't really pay too much attention to the components of our meals. I figure he'll veto anything that isn't 'good.' I see this dish and think, hey lots of veggies, it's got carrots and peas! White rice - yum! Just like when I lived in Japan! 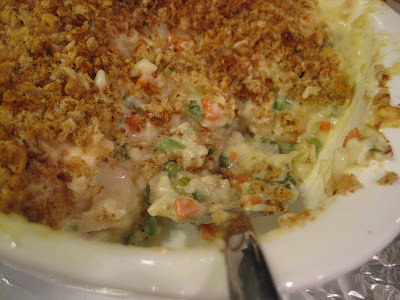 Bread crumb topping - yum yum! He has a different view of this dish. Apparently carrots and peas are veggies but veggies that are high in carbs/starch. Plus this dish has white rice (not brown) and the cheese and whole milk -- not exactly healthy ingredients. This dish is very difficult for him to calculate/judge how much insulin to take. He was correct in his prediction: after dinner his blood sugar spiked. So I think that if we make it again, we'll make just half a batch and maybe some tasty steamed greens or broccoli on the side. Or even a salad to go with it. But I definitely think that making half batch and eating it with a nice, healthy side is a good way to go. Get a little bit of hearty taste and a little bit of healthy taste. hi there! i'm the pr person for the Squirrel Hill Community Food Pantry. is there a way i can email you directly? thanks! -kelly (email kobrien AT jfcspgh.org) ps love your step-by-step direction shots! very helpful!